For shipping out of the US extra postage is required. Click here. Emil Wild was perhaps the most brilliant lamp engineer who ever lived. His designs were exceptionally clean burning and by far the most versatile of any lamp created. 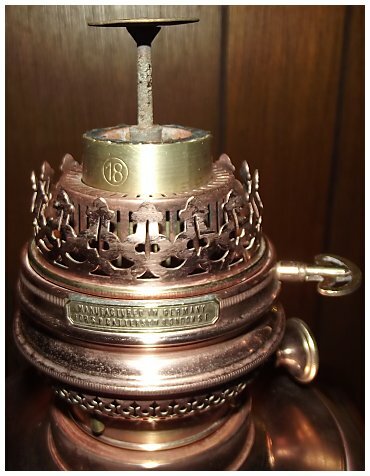 The 18''', for example, was made as a true Kosmos wick side draft with a flat wick (the Imperial burner), a circular wick side draft and a circular wick central draft (Globe/Central Vulcan) and a 20''' Kosmos version with a thimble flame spreader (Agni-Brenner) sold in Europe, all of which used the same chimney! 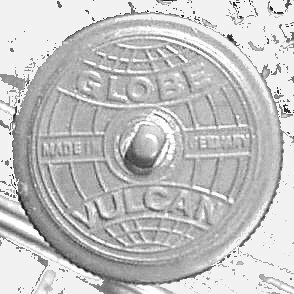 The 30''' Globe Vulcan was perhaps the ultimate "White Light" burner, a lamper's dream furnace, producing incredible light as well as heat. 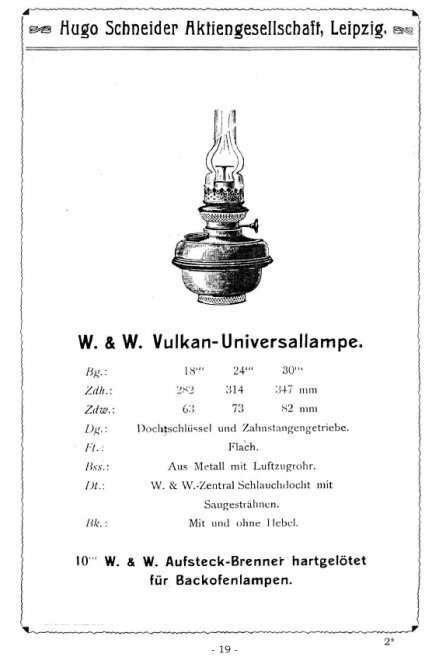 In Germany, these were labeled "Central Vulkan" lamps, in the UK "Globe Vulcan". Wick width 1 7/16" 1 3/4" 1 7/8" 2 1/4" 2 3/4" ? 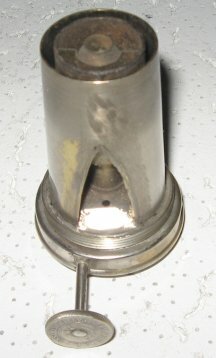 Chimney Base 2" 2 1/4" 2 7/16" 2 3/4" 3 1/8" 3 7/8"
Wild & Wessel of Berlin developed the "Kosmos" burner in 1865, where a flat-wick is formed round. 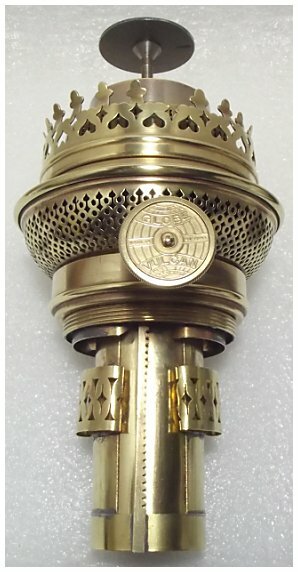 By the early 1880's their absolutely perfected Kosmos burner was being imported into the US as the "Imperial" burner by B&H; in England it was imported by Catterson as a center or side-draft draft burner as the "Globe Vulcan" burner using a post-style flame spreader and a unique wick. 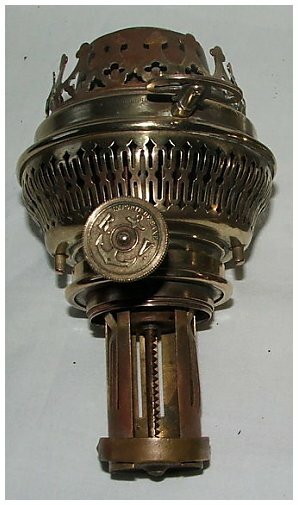 In the US, the Imperial burner may have been used as a replacement for a duplex burner originally fitted on the lamp. 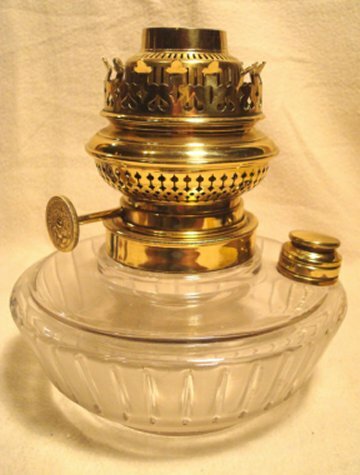 Most of the lamps using the Imperial/Vulcan burners were table lamps, but a few were large, elegant banquet lamps. My 1884 B&H Imperial is shown at right. 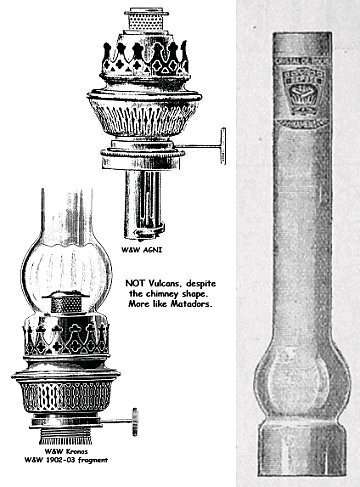 Other Vulcan lamps and burners are shown on the lamp photo page, lower right column. Vulcan chimneys made from tempered borosilicate glass!!!! 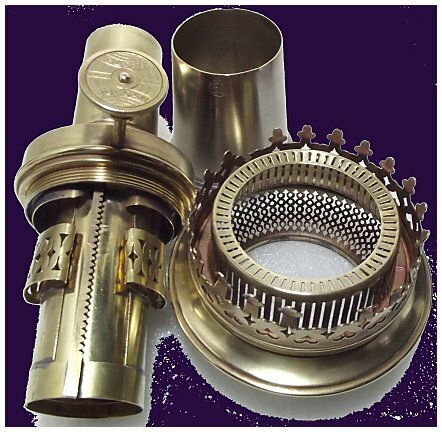 Globe Vulcan 16'''_Chimney, side draft and center draft for Central Vulcan and Globe Vulcan lamps. Special wasp-waist as per the original German design by Emil Wild. Near right, chimney on W&W 18''' Central Vulcan. Click on the image at right to expand it to see the chimney and measurements. THE FIRST NEW VULCAN CHIMNEYS IN MANY DECADES, AND MADE FROM HEAT-RESISTANT BOROSILICATE GLASS. Extra postage required for shipping out of the United States. Chimneys are well protected in sturdy boxes for safely shipping without breakage, but that weight combined with postage rate increases for boxed items that went into effect on Jan. 18, 2016, mandate only one or two chimneys per order, please. 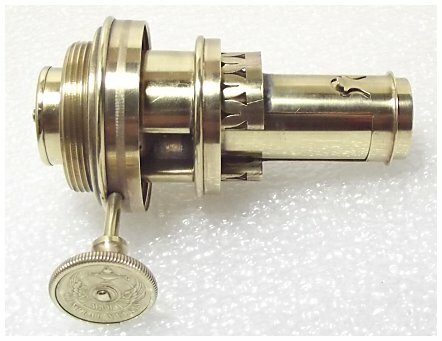 The unique 2- or 3-tailed Vulcan wicks were apparently designed for maximum safety when burning the fuel available in the 1880's and 1890's, which varied considerably in volatility. The wick design seals the font from the burner, preventing any problems with hot fuel vapors igniting and causing a self-sustaining burn. This allowed Emil Wild to design the Vulcan burner for maximum light output, which also meant maximum heat output. 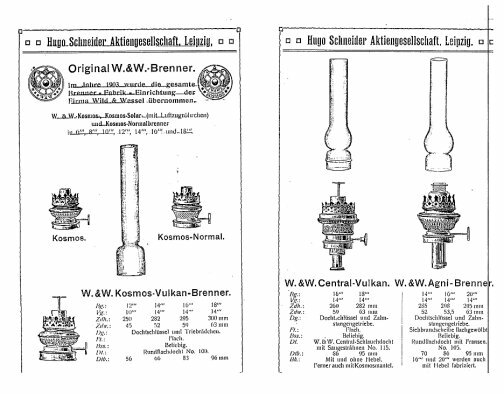 Note: The twin-tailed Vulcan wicks are also used in some Wild & Wessel lamps were were NOT Vulcans! There was a ''Central-Brenner'' which had a very small flame spreader and used a Kosmos-style pinched chimney. 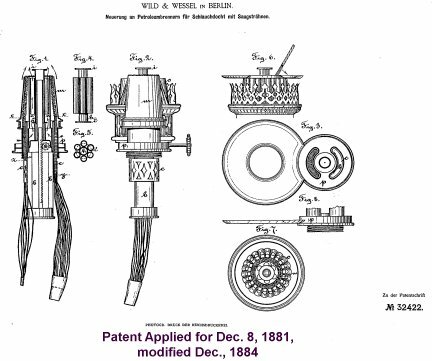 The first W&W Vulkan patent was applied for on Dec. 8, 1881. Note there as a flame spreader. 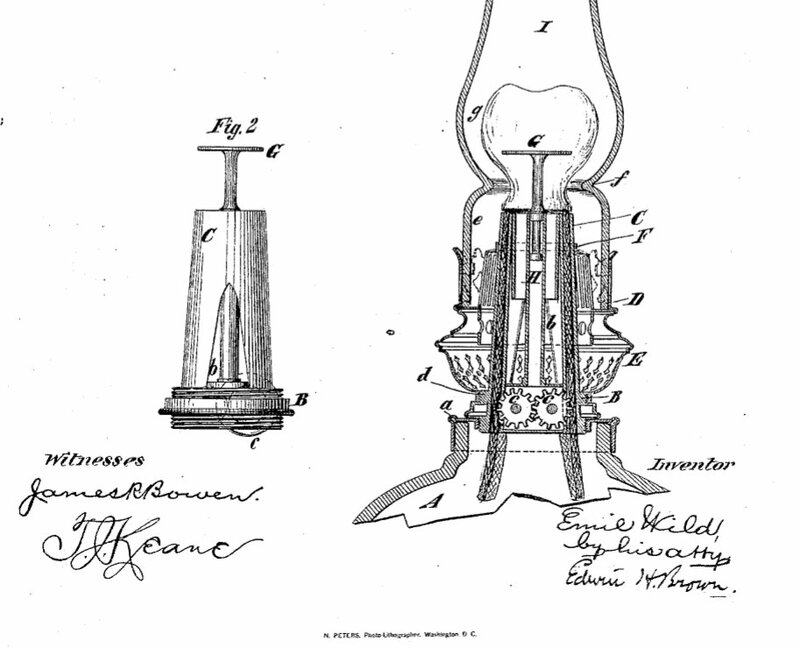 The Henkle US patent for a flame spreader is dated Jan. 15, 1884. 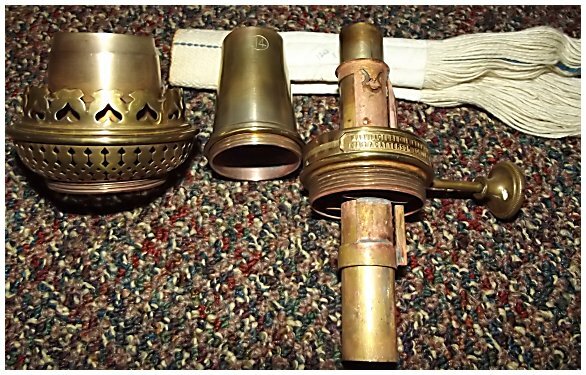 L&B could well have had a post-type flame spreader in 1879 for center draft lamps and a thimble style flame spreader for Kosmos Matador burners in 1879. This patent drawing has a 6-tailed wick. 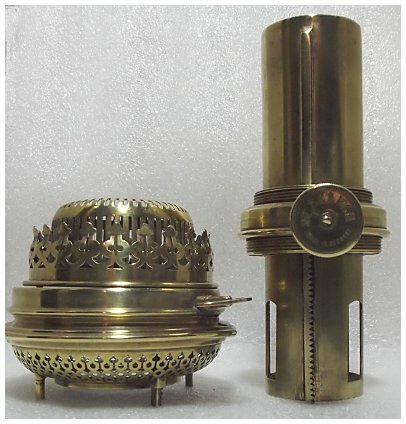 I have not seen any examples of this wick or burner, but they may exist in private collections. 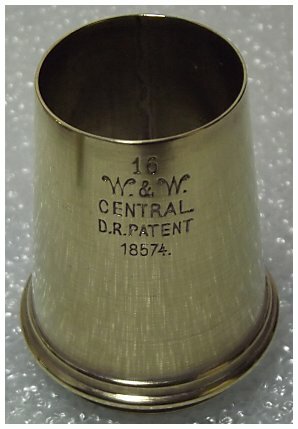 This patent was modified in 1884 for a 2-tailed wick (see below). 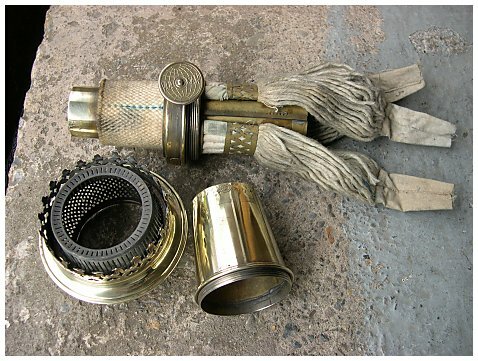 At right, the 1884 modification of the 6-tailed wick to a 2-tailed wick dated 1884. 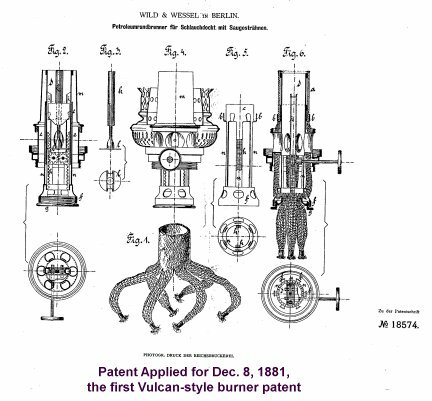 This patent is for a side draft "Central Vulcan" burner. The wick carrier has the distinctive wick "pockets" for the tails, and the base of the carrier is solid and holds the bottom of the gear toothed lift rod. 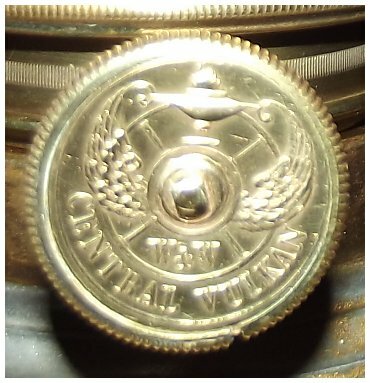 Note also the unique safety feature of Central Vulcan burners: the wick tails go through slots in the bottom of the burner and the circular section of wick above the tails seals off the font. Fuel in the 1880's was of variable quality and some fuel was quite volatile. Below we can see why the Imperial burner marketed in the US was not called an Imperial-Vulcan. The German patent for the Imperial Vulcan is dated July, 1888, 4 years after the Imperial was sold in the US. W&W listing in the 1911 Goldberg catalog. 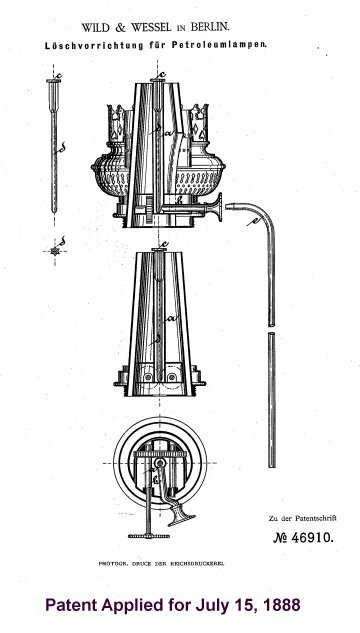 German Patent application of Dec. 28, 1884 for a Vulcan chimney. American patent for Imperial Kosmos, Aug. 19, 1884 Patent application for Kosmos Vulkan dated July 16, 1888. 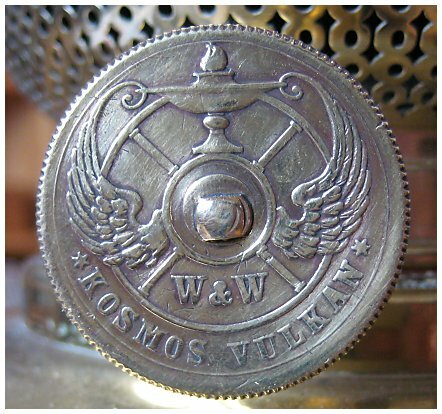 The Kosmos-Vulcan appears to be the same burner as sold in the US as the Imperial, but the Imperial was only sold in 18''' size. 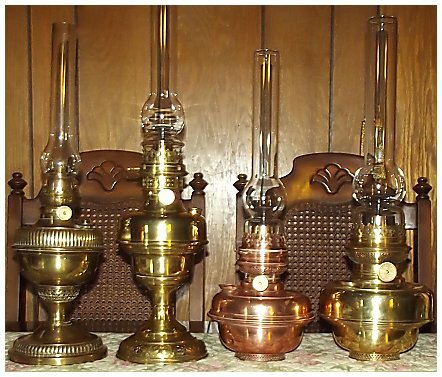 These lamps used the unique Vulcan chimney and a flat wick turned round, Kosmos style. 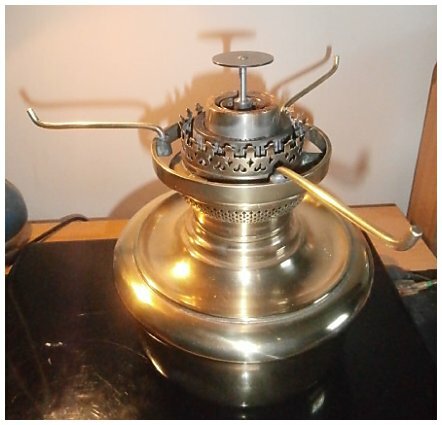 In essence, the top of the burner was Vulcan, the bottom was Kosmos. The Central-Vulkan above left was a side-draft burner with a Vulcan post-type flame spreader and used a 2-tailed Vulcan wick. 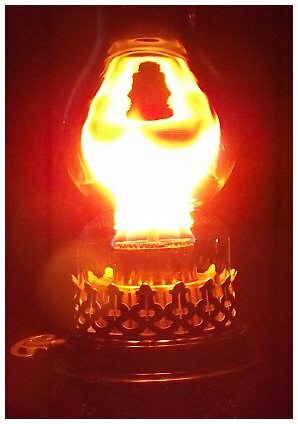 The Agni burner was shaped differently and is shown with a thimble flame spreader and used a flat wick Kosmos style. 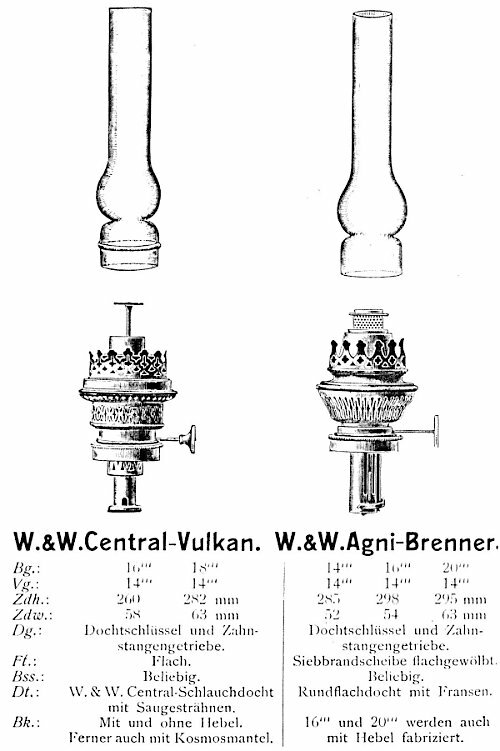 The Agni also had a wick guide, unlike the Kosmos-Vulkan at left. 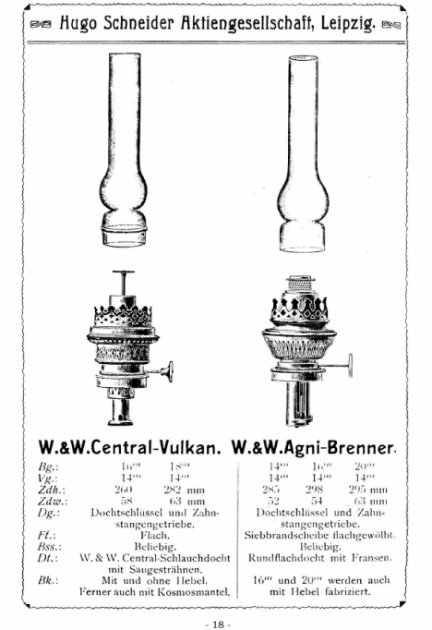 Vulkan-Universallampes were true center draft designs but used a 2-tailed Vulcan wick (14''', 16''' & 18''') or 3 tailed wick (24''' & 30''') with a post-type flame spreader and Vulcan chimney. 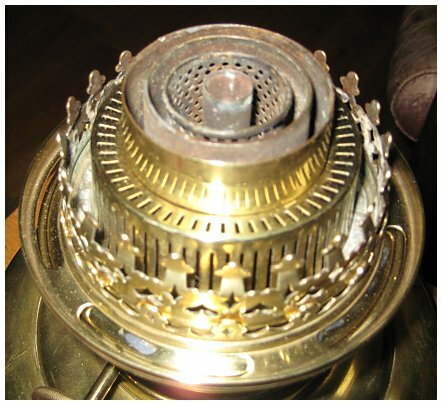 All had wick guides with ''pockets'' below the burner. 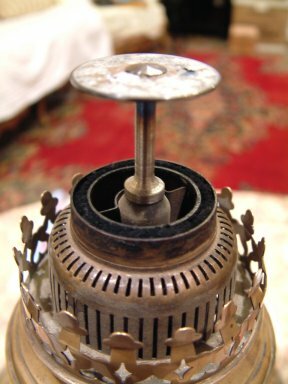 This burner was also used on fancier true center draft fonts, unlike the burners at left. First, my latest Central Vulkan, a 16''' side draft. 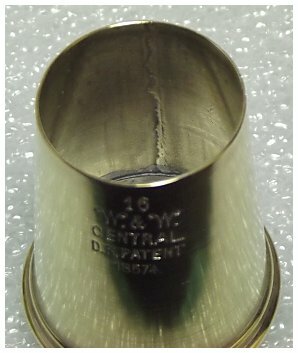 Note the seam inside the tube. The tubes were flat stock formed round, not drawn tubes! The outer wick tube at right covers the assembly above. Polished so well there is no visible seam on the outside of the tube! Wick would be lowered in the photo above. Notice the position of the wick guide clips and complexity/quality build. 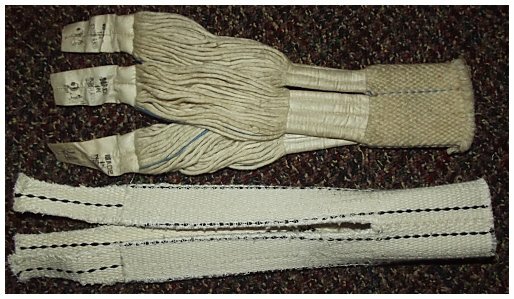 The photo above shows the wick sleeve raised. The burner then fits into the glass insert font > (shown here without the gallery installed). Wild & Wessel 14''' Globe Vulcan, center draft, parts and original wick. 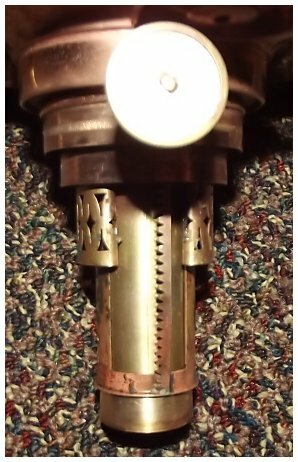 16''' Globe Vulcan burner (side draft) with unusual bayonet fitter for Brit Duplex fonts. Right when you assume you have all the variations of Wild & Wessel lamps figured out, W&W throws in some odd ones. Near right is a 14''' Globe Vulcan with an Agni-Brenner flame spreader without a post - a straight thimble flame spreader! Far right is a 20''' Agni-Brenner with a Vulcan post-type flame spreader! The Agni-Brenner is a true Kosmos style using a 3 9/16" thick,flat wick, uses an 18''' Vulcan chimney, but unlike the Imperial has a wick carrier. These two variations are not supposed to exist. W&W 18''' Central Vulcan, center draft. Note bottom of draft tube is open. With lift gallery. W&W 18''' Central Vulcan, center draft. 30''' W&W Central Vulcan side draft; bottom of draft tube closed. 30''' W&W Central Vulcan center draft. 30''' W&W Central Vulcan side draft. 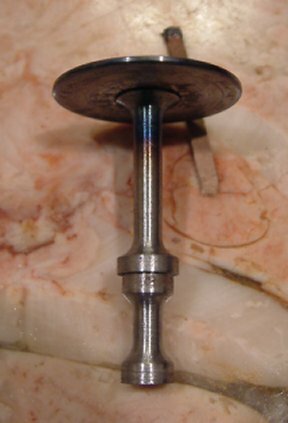 30''' W&W Globe Vulcan center draft burner, apart, showing the wick pockets on the wick sleeve. 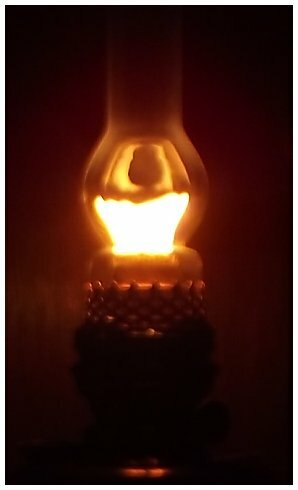 Vulcan wicks are unlike any other center draft lamp wicks, but I can make them. 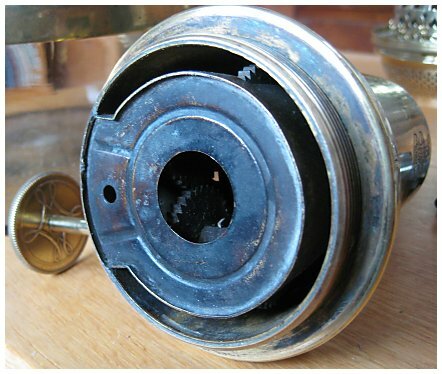 The photo above shows the slots for the 3 tails of the wick. The tails fit first though the slots above, then on down through the pockets shown at left. The flame spreader support is visible in the draft tube. 30''' Globe Vulcan burner assembled. Note this is a true center draft burner requiring a draft tube. 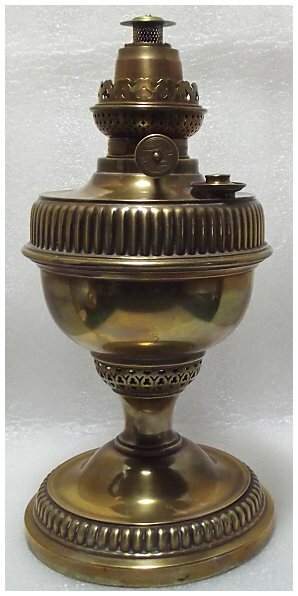 The 30''' Globe Vulcan could be used in a heater body (left) or as a lamp (right). It burns so brightly the camera was overwhelmed by the light. Lamp owned and photographed by Rob Gregor. Click on the photos to enlarge them. This series of 30''' Vulcan burners show the incredible genius of Emil Wild. The burners above use the unique 3-tailed Vulcan wick in both side draft and center draft versions. The side draft Vulcan burns above are not Kosmos burners because they have a tubular top section of wick above the 3 tails. Below right is a 30''' Kosmos Vulcan burner which uses a very wide, thick flat wick. The burner details are shown. 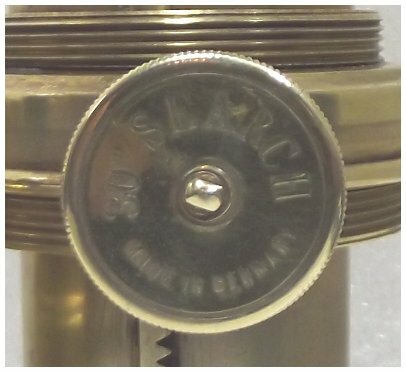 The next section below shows a real center draft Vulcan burner (sold under the "Search" label) using a tubular wick. And all of these 30''' Vulcan burners use the same flame spreader and require the wasp-waist 30''' Vulcan chimney. Bottom of 30''' Kosmos Vulcan burner. Burner markings show this lamp was intended for the French and British market. 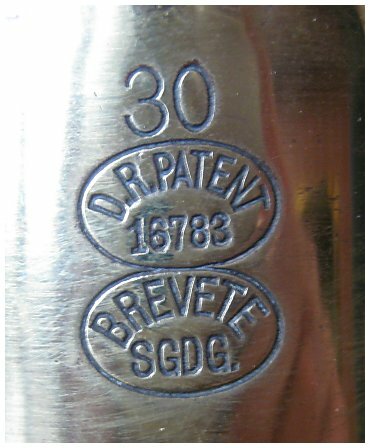 The British patent number indicates manufacture in 1884. 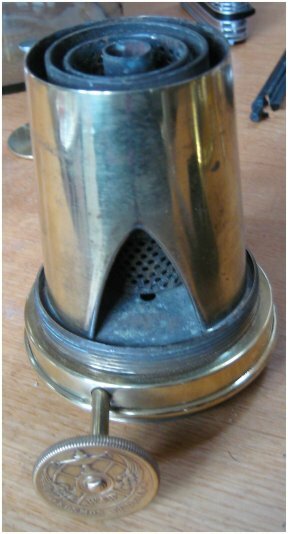 Burner with sleeve at left removed, showing the unique perforated inside tube. At right is my B&H "Imperial" lamp. The contrasting colors - bottom polished brass, center silver, top polished brass - are highlighted beautifully. 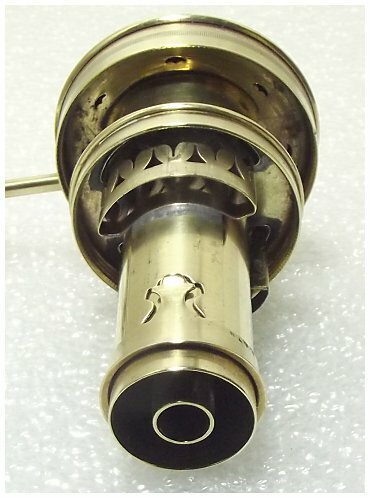 The Imperial burner unit is a Kosmos-Brenner type flat wick burner using a 3 5/8" wide wick. 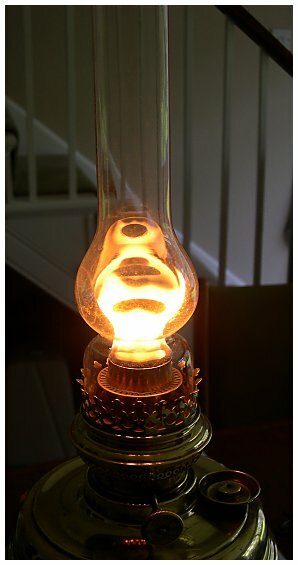 This is a rare non-circular wick B&H lamp with a drop-in fount. It was apparently sold with a duplex wick burner and retrofitted with an Imperial burner made by Wild & Wessel in Berlin, Germany. Now that a marked 30''' Kosmos Vulcan has surfaced (above) which is essentially a scaled up version of the Imperial burner, it can be stated with certainty that the Imperial burner marmeted in the US really is a Vulcan burner. 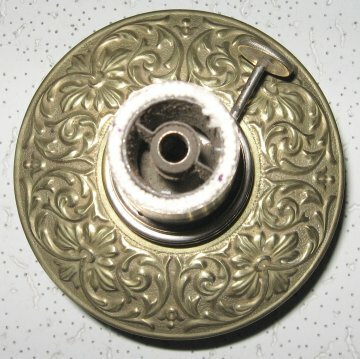 This lamp appears to have been entirely made by W & W rather than being a burner adapted to a duplex lamp font. 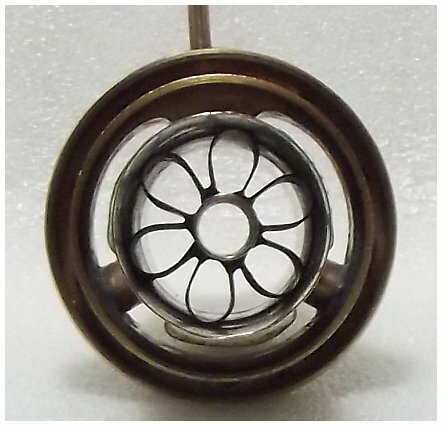 The burner is larger and heavier than the B&H Imperial's burner (above) with the same patent date. 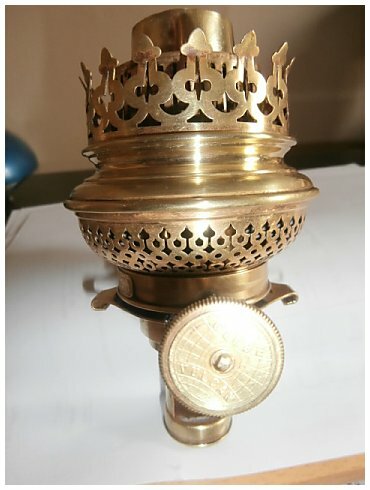 The font is cast brass, not turned or formed. It is heavy. 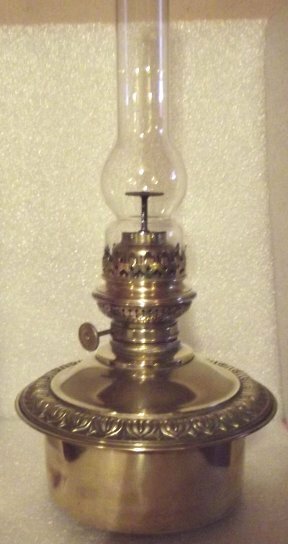 This lamp was sold by "SHREVE CRUMP & LOW MFG CO BOSTON" as marked on a brass plate on the bottom of the font: the company was founded before the Revolution and is still in business. This lamp is illustrated wearing one of my Imperial/Vulcan chimneys and an Alex Marrack flame spreader. 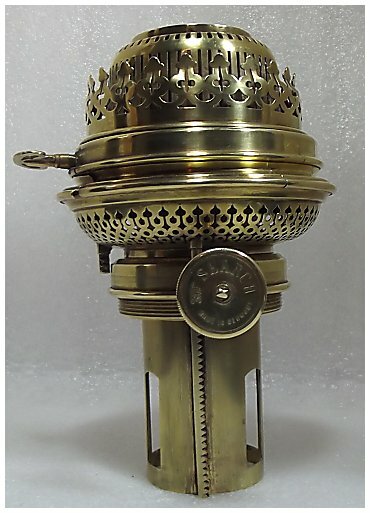 The flame spreaders for these lamps have been almost always lost over the years. Precise new flame spreaders made to original specifications are available from Alex Marrack in England. 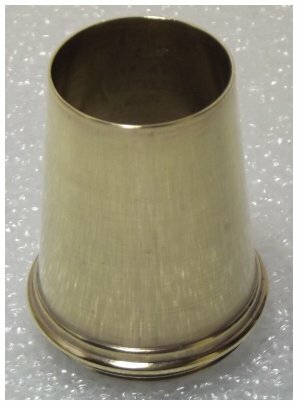 I now have new Vulcan chimneys! This 30''' Search burner is a true center draft burner using a conventional tubular wick of the exact same diameter as a 30''' Central or Globe Vulcan burner. It is the exact opposite of the 30''' Kosmos Vulcan above. This huge burner weighs almost a pound by itself! 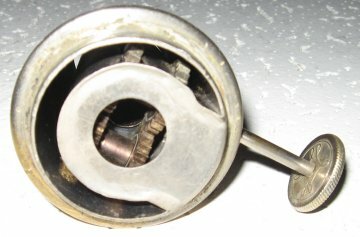 Though not signed as a W&W burner, the gallery is the same as other 30''' Vulcan burners and the techniques of using flat stock formed round instead of tubing; soldering so precise the solder line is only visible with a magnifier on the inside surface of parts, and the same gear track as the 30''' Vulcan burner above demonstrates this is a W&W burner. Left to right above, 14''' Catterson center draft Globe Vulcan with Agni draft tube and flame spreader. 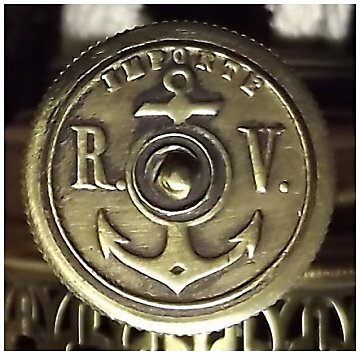 16''' Central Vulcan side draft burner, "R V Importe" for the French market, in 20''' L&B side draft font. 18''' Central Vulcan center draft in copper W&W Universallampe font. 30''' Central Vulcan in W&W Universallampe font. From my collection. 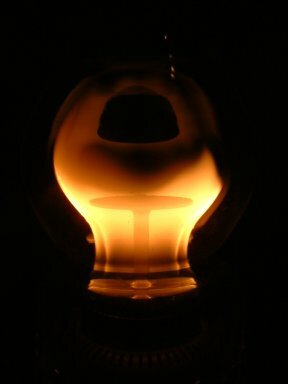 I burn mineral spirits (LOMS) or a combination of 50% kerosene and 50% mineral spirits in my Globe Vulcan lamps. 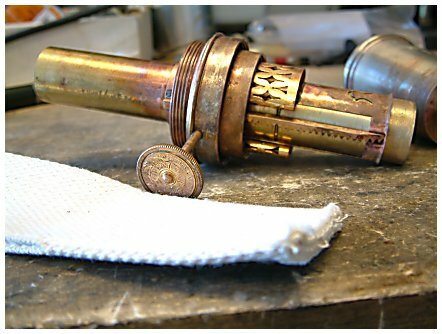 With the Vulcan design burners, Emil Wild took capillary action to the extreme, really stressing the ability of the wick to supply the burner with sufficient fuel to produce the white light flame. 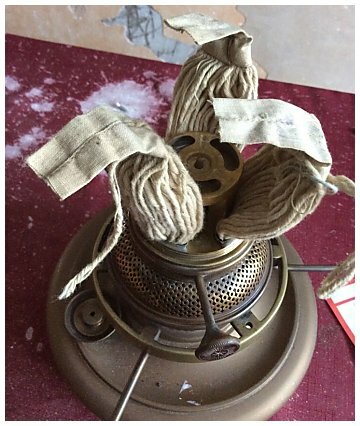 LOMS is thinner and more volatile than kerosene and therefore has better `'wicking'' ability than pure kerosene and can properly feed to the top of the wick in a Vulcan. Kerosene is thicker and the result is fuel starvation which causes the wick to burn down much faster than when burning LOMS or a combination of LOMS and kerosene. 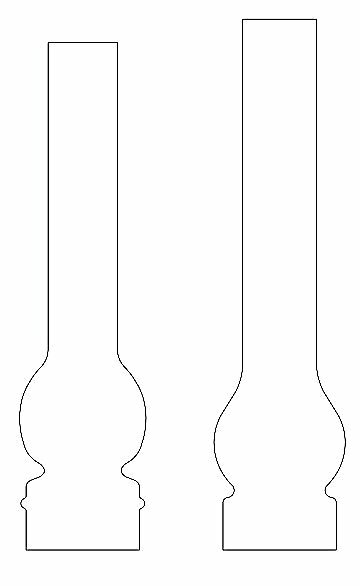 For reference, here are the dimensions for 14''' and 16''' Vulcan chimneys. These original, signed chimneys are from my own collection. I also have an original 12'' Vulcan chimney. 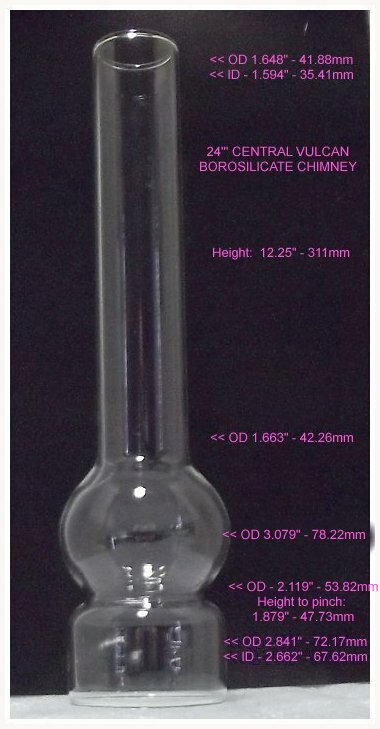 If there is any interest I could have the 12''' and 14''' Vulcan chimneys replicated in borosilicate glass. Email me if interested. 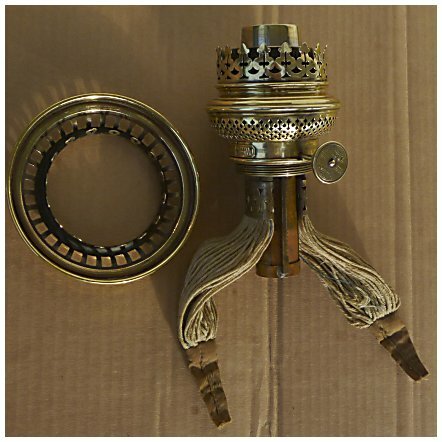 Indicia detail on lamp shown at left. Click photo to enlarge it. The measurements on the two chimneys shown can be read more easily by clicking on each photo to enlarge them. 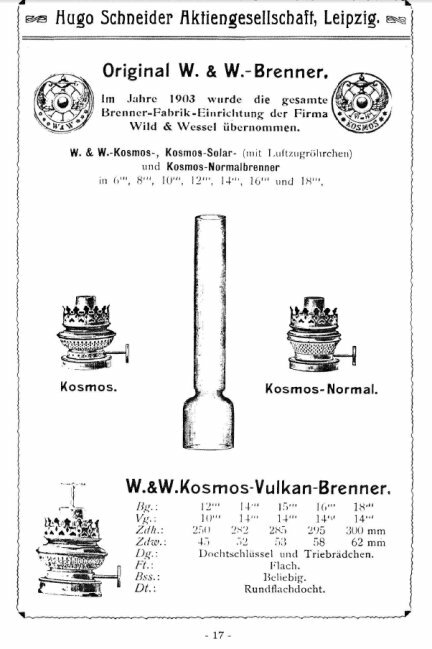 As mentioned above, Wild & Wessel of Berlin in 1865 developed the "Kosmos" burner. Emil Wild was an undoubted genius at lamp designs. 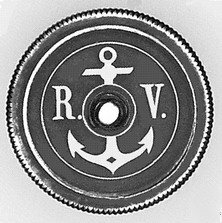 His August 19, 1884 design for a burner with a flame spreader was sold in the US as an "Imperial" brand and in the UK under the "Vulcan" brand name (The Imperial patent was granted to Emil Wild of Berlin, Gemany, the assignor was Bennett B. Schneider of Orange, NJ.). 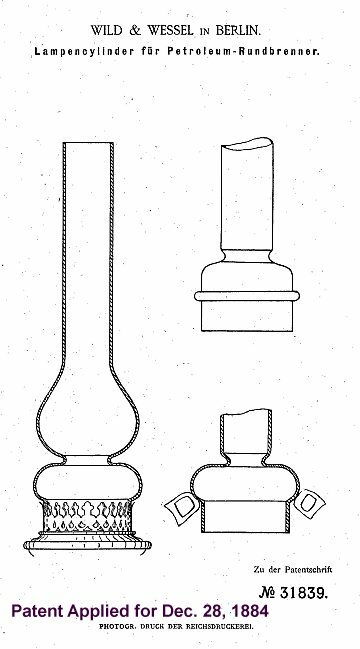 The unique chimney for that burner was also patented by Emil Wild. Unfortunately, Emil Wild was apparently not an astute businessman. From what I can determine, Wild had an exclusive import arrangement with Bradley & Hubbard in the US and Catterson's in the UK, yet failed to put a performance clause in either contract. 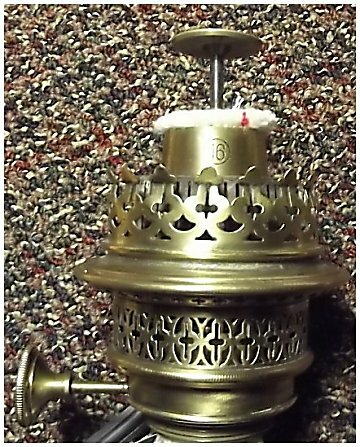 B &H was far more concerned with marketing their new line of center draft lamps than trying to market the more expensive, exquisite Imperial burner. 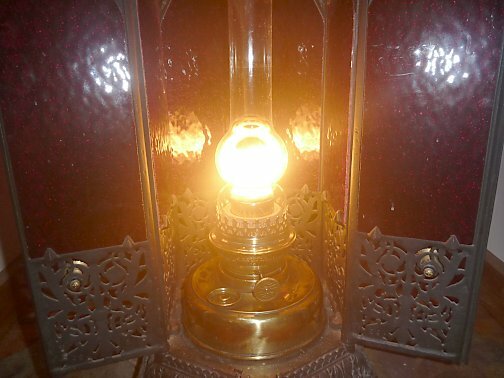 And Catterson's in the UK was more interested in selling lamps in their London department store than actually working as a wholesale agent for the Vulcan line of lamps - to the point their Vulcan lamps actually had their own badge on the burner! 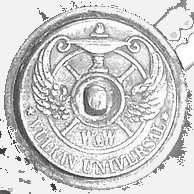 (There are supposedly Vulcan lamps found in the UK without the Catterson's badge, so they apparently did some wholesale business.) 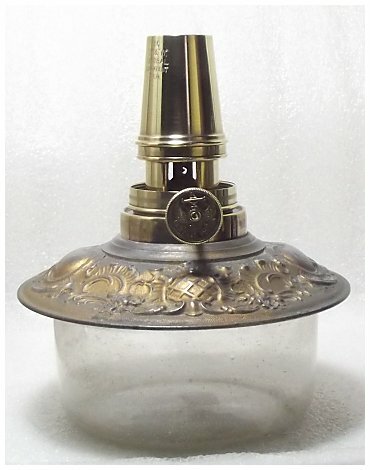 Thus Imperial and Vulcan lamps are quite rare, which is a real shame because they were one of the cleanest burning lamp designs ever produced. W&W Vulcan chimneys appear to be the same as W&W Agni chimneys. They are NOT the same. The main dimensional change is the Agni chimney has a shorter height to the pinch. Antonio Cota Fevereiro of Lisbon, Portugal, has contributed the magnificent photos and drawings below to show the difference in the two chimneys. The Vulcan chimney has a base-to-pinch height 3cm (1.18") higher than the Agni, and an 18''' Vulcan chimney is 47mm (1.85") taller than a 20''' Agni chimney. Click on the images below to enlarge them. Please note there were exceptions! 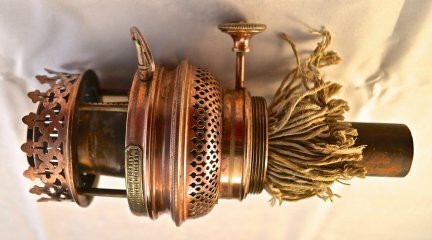 After Hugo Schneider purchased W&W in about 1902 they would apparently make up lamps with parts at hand. 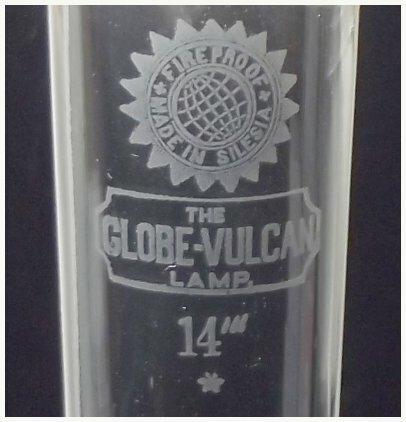 I own a 14''' signed Globe Central Vulcan lamp with a factory-installed Agni flame spreader, and Collin in the UK has two 20''' Agni lamps with Vulcan flame spreaders! 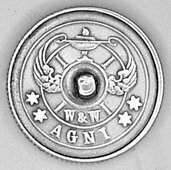 If you need to know if your Agni will accept a Vulcan chimney, refer to the detailed measurements shown above and measure your lamp from the chimney base to the disk on the flame spreader. W&W Imperial Flame Spreader. This 18''' flame spreader was used on most 18''' Vulcan lamps whether side draft, center draft or Kosmos, varying only in size from 14''' to 30'''. 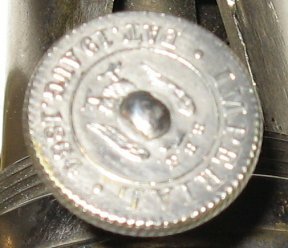 W&W Agni flame spreader with a post, but variations exist which are straight thimble flame spreaders as on my 14''' true center draft Catterson Central Vulcan, shown above. Superimposed, Vulcan chimney in red. Note the pinch in the Vulcan chimney is noticeably narrower than the Agni. Antonio noted "The Agni chimney works perfectly with Matador burners. The Matador chimney does not work with the Agnis, rather tricky..."
Address was the Globe Lamp works, 87 to 89 Newington Causeway, Worthing, London SE1. 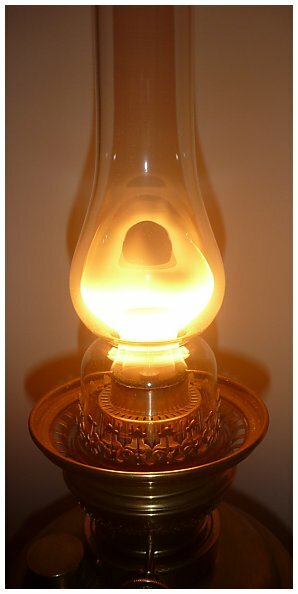 The Firm traded as "Lamp Manufacturers and Importers/Exporters" and their primary product line was Paraffin/Petroleum Lamps and Stoves. 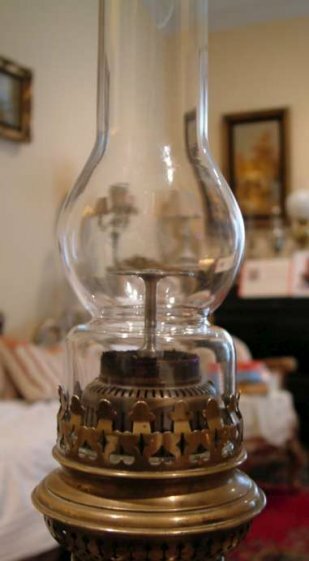 From the mid 1880's they exclusively sold limited quantities of the Wild & Wessel Lamps to one of the large London Department Stores and apparently had a small wholesale business in lamps as well. They also had a smaller operation in Liverpool and that branch was called "The American Light Co" and it sold "Electrical Apparatus and Appliances". In the 1930's, large sections of the UK economy were suffering contraction as a result of the "Great Depression" and Catterson's relatively narrow market segment had also contracted. Thus not only were they operating in a difficult economic environment but at that time they also became subject to serious and ongoing fraud by their head Cashier. The fraud continued for at least 3 years due to inadequate internal controls and after it was finally detected and the culprit duly punished, it also resulted in a Court Case between Catterson's and their regular Auditors, in which they claimed the Auditors had been negligent by not detecting the fraud earlier. It was noted by the Court that their Auditors had earlier advised Catterson's Directors on their business lacking adequate financial controls and they had also recommended a number of changes be made, but those were not put in place. The following sequence of events is generally considered to have been the major factors in the business failure and they entered liquidation in 1937. Catterson's, like many firms of their time, had underestimated the impact and the duration of the Western Worlds recession and they were also reluctant or unable to undertake rapid and significant restructuring. The financial cost from the long period of fraud was also significant and they then faced substantial costs from an unsuccessful Court Battle. Above, Rob Gregor's fabulous 18''' Arts & Crafts style W&W lamp. Original wick in the burner.